"Steel against steel.. We shall see which heart is sharpest.” This dogged statement by the Bonapartist general in The Duchess of Langeais sums up the nastiness of the courtship depicted in Jacques Rivette’s 2007 black comedy. An intertitle calls the scandalous romance a "sentimental war” and indeed for every jaded cry of devotion uttered there is a taunt. The closest the soldier and the married socialite get to sincere passion is after he has kidnapped her and threatened to maim her with a branding iron; so their vindictive amorous adventure is aptly compared with a sword fight. 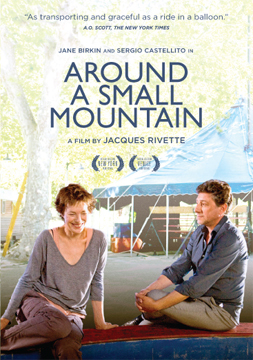 Around a Small Mountain, Rivette’s follow-up, deals with a different sort of emotional entanglement involving a traveling Italian and a circus performer. Vittorio first encounters Kate on a deserted rural road in the languedoc-Roussillon region. He nonchalantly fixes her automobile engine. later he watches her troupe’s show and then decides to stay for a while, befriending the artistes and curiously seeking the reason for Kate’s noticeable sorrow. But she objects to the investigation: “You meddle into things you don’t know! You hurt me!” Around a Small Mountain’s chaste affair is painful, but not in the manner of The Duchess of Langeais's perverse combat. The new film acknowledges the tribulations of intimacy—perhaps even its impossibility—by depicting the rapport between Vittorio and Kate as faltering, yet Rivette insists on the kindness that sustains it and the reconciliation it enables. Kate’s hurt can be alleviated; pain does not have to last. The notion is well expressed by Kate’s sister, margot, near the end of Around a Small Mountain. After the partner of strongman and acrobat Wilfrid ends their relationship, Margot takes his arm affectionately, with the gesture of a new lover, and says, “the landing is soft.” This softness contrasts with the the sharpness of The Duchess of Langeais. In most circus films, conflict is inescapable. Performers compete for status, bosses are dictatorial (“In my circus there’s room for only my way,” says the manager in Trapeze), jealousy and seduction are rife. Subordination and dominance are also often at stake in the visuals of these films. Cinematography frequently accentuates the camera’s distance from the action, notably in the extreme high and low angles favored in Trapeze (photographed by Robert Krasker) or the wide shots in The Greatest Show on Earth that encompass all the rigging and peripheral bustle of the big top and thus emphasize the cordon between spectator and spectacle. Such imagery creates a strikingly oppositional world: inside and outside, reality and appearance, high and low. Calamity is commonplace in such a divided realm. In keeping with the stress on hierarchy, downfall is a crucial recurring idea. flying acrobats plummet disastrously to the ground in The Greatest Show on Earth and Trapeze, ruining their careers, and in a remarkable scene in Charlie Chan at the Circus another aerial performer is shot in mid-air by a rifle poked through the canvas. The descent is metaphorical too. The performers in Freaks are society’s outcasts; a clown in The Greatest Show on Earth is a criminal on the run; the proprietor in Sawdust and Tinsel longs to better his social position and “be an honest citizen.” The motif is crucial in the greatest circus film, Lola Montes (Max Ophuls, 1955), with its ersatz crowns rising up and down while tableaux vivants stage incidents in the story of the “femme fatale” who outraged nineteenth-century Europe by doing “everything that women dream of doing, but lack the courage to do.” Once a countess, now this notorious beauty is reduced, “worn out before her time,” to dramatizing her life for a paying crowd. At the climax of the film, she is winched upward as the ringmaster declaims the story of her affair with a monarch—“Even higher, Lola, even higher! Lola reaches the summit! Lola comes to power!”—in preparation for the finale of her act, a fearsome dive from this theatrical zenith, which seems nearly as high as the burning model skyscraper from which the young elephant swoops in Dumbo (Ben Sharpsteen, 1941). Rivette, however, refuses such hierarchies and cruelties. One of his subversive devices, simple but effective, is repetition. Echoing the way the chain-breaking act is repeated in La Strada, a benign clown routine involving brittle plates and a harmless revolver is shown four times in Around a Small Mountain. The sequence of scenes bears no relation to the customary orderly tempo of a circus lineup, where one act builds to the next, moving up the scale of celebrity and excitement. Instead of any systematic ascent like that, the four clown appearances are connected loosely, drifting nonhierarchically in and out of Around a Small Mountain. On each occasion the camera is in a slightly different position, but it is always near to the performance, inside the ring rather than looming above the scene or situated where the audience would be. This placement cancels the distinction between observer and performer—just as, in the last iteration of the act, Vittorio nervously stands in for a member of the troupe who has been incapacitated after a drinking binge. Unless that overenthusiastic intoxication is counted, Rivette’s tiny provincial show (entry fee five euros) is not the setting for downfalls of any kind. Though Kate’s niece, Clémence, is said to be a trapeze artiste, she is never seen performing, let alone plummeting. Stability is emphasized instead of danger: in one mesmerizing scene, an assistant pulls on a rope connected to wires that suspend Wilfrid a couple of meters above the ground while he elegantly cavorts like a dancer in zero gravity. He “floats”rather than “flies” and this beautiful image of cooperation and graceful lateral movement contrasts with the vertiginous vistas of other circus movies. The horrible manner of Antoine’s death recalls acts of aggression in earlier films. At the beginning of The Circus (Charles Chaplin, 1928), the owner threatens to whip his daughter. In the Disney film, Dumbo’s mother is lashed and chained after she angrily defends her child. In Sawdust and Tinsel, the implement is connected not only to tyrannical authority but also to male sexual insecurity when the cuckolded Albert removes his thespian rival’s straw hat with his ringmaster’s lash. But Around a Small Mountain does not allow brutality to persist. At Vittorio’s instigation, Clémence sits in what would have been Antoine’s place as Wilfrid prepares to perform the whip act again. Horrified, Kate steps in from the wings, holds the newspaper, and reenacts in an inverted form—and in safety—the lethal incident from long ago. It sets her free to live again, or so she tells Vittorio, the kind-hearted amateur clown. The reenactment is a strange psychoanalysis, but it heals Kate. She is not dead to the circus anymore. This time the razorlike cut of the whip revitalizes instead of killing. Rob White, editor of Film Quarterly, is the author of The Third Man (BFI Film Classics, 2003).